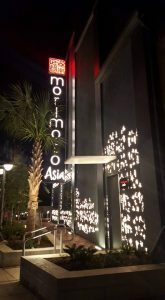 No restaurant was I more excited to try this trip than Morimoto Asia. 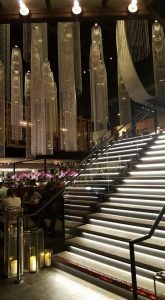 I’m a big fan of Iron Chef Morimoto and have been for years, so to get the chance to eat at his place, I couldn’t wait! First of all, this place is stunningly beautiful with beautiful chandeliers hanging down. It’s very posh and reminded me of some of the upscale places I see in the casinos in Atlantic City. I can easily say it’s one of the most beautiful restaurants I’ve eaten at in WDW. It’s not necessarily kid-friendly however, compared to other Disney restaurants. A lot of places will give your child crayons with a kids menu – not here. Thankfully, I had her Leapfrog to keep her occupied until food got to the table! The kids menu has Japanese specialties so if you have a picky eater like mine take caution. We ordered her the kids mac and cheese – hold the panko. I thought it was creamy and yummy. Not her. She filled up on edamame. 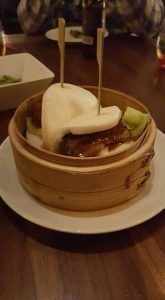 We started with Kakuni Pork Bao, steamed buns, braised pork belly with lettuce and spicy mayo. It was small, with two small portions, but was really good. For dinner, I figured if I’m eating at Moriomoto’s I ought to get sushi. 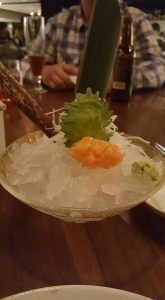 I started with some salmon sashimi, which was beautifully presented and very fresh. I chose the spicy tuna roll and shrimp tempura rolls for dinner. I was underwhelmed. There isn’t much selection for rolls to begin with, very basic. The sushi was just ok. I’ve had better rolls in New Jersey. The entrees however were very, very good. I was able to try everyone in my group’s and everything was outstanding. The Morimoto Buri-Bop is Korean style yellowtail rice bowl, served in a hot clay pot, finished with an egg yolk and prepared by your server table-side. It was absolutely delicious and fun to watch everything cooked right there! The L.A. BBQ Kalbi marinated grilled boneless short ribs were spicy but yummy. No room for dessert tonight! Overall rating: B – Stick with the entrees, skip the sushi, have back-up food for a picky kid!